The town at the head of Thunder Bay that would eventually become known as Alpena was first laid out in 1840, and named "Animickee," Chippewa for "Thunder" in honor of the Chippewa Chief with whom Henry R Schoolcraft signed the 1826 treaty through which the government obtained the land and its forest and mineral bounty. As Lumbermen began expanding their vision to Lake Huron's northwestern shores, an increasing number of lumber hookers began seeking the entrance to the Thunder Bay River and the seemingly limitless forests that spread across the hills surrounding the bay. By the close of the 1850's, the cry of lumbering interests rose to push for improvements at the growing settlement, and in late 1857 a group of influential lumber barons signed a petition requesting that the Federal Government appropriate funds for the construction of a pier and lighthouse at the river mouth. Michigan Representative Dewitt Clinton Leach took up their call, presenting their memorial before the House on February 5, 1858. Four days later, he followed up with the request for a bill for the appropriation, however the matter garnered little interest on behalf of his fellow House members. A tenacious politician, Leach again presented the memorial on February 15th, this time in a sufficiently persuasive manner that the mater was refereed to the Commerce Committee for further evaluation. Pushing further, Leach introduced HR Bill 403 on March 16, requesting an appropriation for the piers and lighthouse. Still unconvinced of the validity of such an expenditure, the House again referred the matter to the Commerce Committee. Leach again pushed the issue on April 15, however remaining unconvinced that there could be any value to such an expenditure in the wilds of Michigan's northern frontier, the House instructed the Commerce Committee to abandon its investigation, and the matter was dropped. A decade later the easily accessible forests to the south were being quickly depleted, and lumber interests again set their sights on the forests around Thunder Bay. After prodding from the lumber barons, the Lighthouse Board dispatched a survey crew to the area in 1866 to identify the most appropriate location for the construction of a new Light to guide vessels into the river. Selecting Trowbridge Point, 1 1/4 miles to the northeast of the river as the best location, the Board requested an appropriation of $10,000 for the construction of the new Light. Alpena's lumber interests were incensed. Convinced that any Federal money would be better spent in their harbor than out on Trowbridge Point, a petition was quickly drawn up and presented to Michigan's Federal representatives in an attempt to reverse the decision. Senator Zachariah Chandler presented the petition before Congress on January 6, 1867, and was quickly followed by Representative Thomas White Ferry on February 25. Undaunted by their pleas, Congress followed the Lighthouse Board's recommendation and appropriated $10,000 for the construction of the lighthouse on Trowbridge Point on March 2, 1867. Evidently the matter was not dropped by the citizenry of Alpena, as the Lighthouse Board changed its recommended location for the Light in its 1867 annual report, stating that "subsequent examination has shown that the proper site is at or near the mouth of the river, into which vessels and steamers now regularly pass to the town of Alpena. This town, which is said to contain two thousand inhabitants, and is rapidly increasing in size, is situated at the mouth of the river. It is therefore recommended that the terms of the act be so changed as to permit the location for the lighthouse to be chosen accordingly." Congress approved the site change on July 20, 1868, and with a private contractor working on piers at the mouth of the harbor, Eleventh District Engineer Brevet Brigadier General William F. Raynolds determined that it would be best to await the completion of the north pier, upon which he planned to construct the new light. Over the following years, the piers were successively extended, and with no immediate end to the project in sight, Eleventh District Engineer Major Godfrey Weitzel decided to erect a temporary light at the river mouth until a more permanent solution could be undertaken. To this end, a fixed white hand lantern was suspended atop a pole erected on a pile cluster some 400 feet from the north side of the river entrance in September 1875. Standing 25 feet above the water, the light was visible for a distance of 10 miles in clear weather. E G Howard was appointed as keeper of the temporary Light, exhibiting it for the first time on the night of October 25, 1875. Without a permanent dwelling, Howard was forced to rent a room in town. With construction of the piers drawing close to completion in 1877, General Weitzel drew up plans for a permanent beacon on a timber crib to be constructed on the line of the north pier. The plan called for a brown painted, timber-framed pyramid structure, the upper two-thirds of which were enclosed to create a watch room and a service room below. Above watch room, a square gallery with iron railing was constructed, on which a prefabricated decagonal cast iron lantern was centered. Containing a Sixth Order Fresnel lens at a point 44 feet above the upper level of the crib to the focal plane, the new light was visible for a distance of 10 miles out in the bay. While construction was completed in July, the light was not exhibited until the evening of August 18. That same summer, a site for a permanent dwelling for Keeper Howard was selected close to the pier, with the structure completed that fall. 1888 was no doubt a memorable year for Keeper Howard. On July 12 a fire started in one of the sawmills along the river. Fueled by high winds and the huge stacks of lumber along the river bank, the fire destroyed over two hundred homes as it swept across the town. The fire traveled along the wooden pier and completely destroyed the woodwork of the both the crib and lighthouse, along with everything contained within, including the Sixth Order lens and lamp. While Howard could do nothing to stop the fire from consuming the lighthouse, armed with buckets of water carried from the river, he and his wife fought all night to save the dwelling and all of their worldly belongings. Until a arrangements for a more permanent solution could be made, Howard erected a lantern suspended from a pole 25 feet above the water at the base of the burned pier. As a result of the tight fiscal constraints, materials were not readily available for the station's reconstruction, and Eleventh District Engineer Major Samuel M. Mansfield was forced to be resourceful in order to find the necessary materials. The lantern was removed from the abandoned North Point Light in Milwaukee. Shipped to the Detroit depot, it was completely refurbished. A Fourth Order Fresnel lens that had been ordered for the planned lighthouse at Two Harbors was taken out of storage for temporary use at Alpena. The lantern, lens and construction materials and a work crew were loaded on the lighthouse tender AMARANTH and delivered to Alpena, where construction began immediately. Howard exhibited the new light on the night of October 1, 1888, and the work crew finished construction and departed for the Detroit depot on October 6. A new Sixth Order lens was ordered, and on its installation in the Alpena Light in April, 1889, the Fourth Order lens was returned to Detroit for storage, where it remained in storage until the completion of the Two Harbors station in 1892. Whether as a result of his experience with the prior year's fire, or as a result of age, we have yet been able to determine. However, Howard resigned from lighthouse service on July 1, 1889, to be replaced by John C Wallace, who accepted the transfer to Alpena after serving three years as First Assistant at the Port Austin Reef Light. 1891 saw the installation of a fog bell on the exterior of the lower service room. An automated striking mechanism operated by clockwork located in the service room was connected to a hinged hammer which struck the exterior of the bell through an opening in the service room wall. Other than the erection of a wooden picket fence around the dwelling in 1892, and the construction of a brick oil storage building on the property in 1898, life for Wallace settled into what must have been a comfortable routine, as he would end up serving 31 years as the Keeper of the Alpena Light. 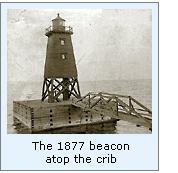 In 1914, the old wooden beacon had deteriorated beyond repair, and the decision was made to replace the decrepit structure. The design selected was somewhat similar to that which had been used on the Breakwater at Marquette. Erected atop a new concrete pier, the structure consisted of a four-legged pyramid skeleton tower surmounted by a circular watch room. An octagonal lantern erected atop this watch room was encircled by an iron gallery with a tubular safety railing. A temporary lens lantern was suspended on the old beacon while the Fourth Order lens and automated fog bell apparatus were carefully disassembled and moved to the new structure, where the lens was installed in the lantern at a focal plane of 42 feet. With reliable electricity available in the city, a power cable was run to the new light, and hooked up to a 320 candlepower incandescent bulb within the lens. After receiving a coat of black paint, the structure was complete, and Keeper Wallace exhibited the new Light for the first time on the evening of June 26, 1914. To better differentiate the light from the growing number of lights in the city, the characteristic was changed to occulting white on June 28, 1918. After modification, the light exhibited an isophase characteristic of alternating 1-second periods of light and darkness. John Wallace resigned from lighthouse service on June 7, 1920 and was replaced by George H Burzlaff after a fast-paced thirteen year career as assistant at Raspberry Island, Point Iroquois, Round Island, Big Bay and Tawas Point. Three weeks after Burzlaff's arrival, a crew arrived at the station to replace the tired old fog bell apparatus with an electric siren, which sounded a blast of 10 seconds duration followed by ten seconds of silence. This siren was itself replaced by a compressed air horn in 1932. In order to increase its usefulness as a day mark, the structure was painted red in the 1950's. With the launch of Sputnik on October 4, 1957, locals noted the similarity of their beloved light station to the Soviet satellite, and the structure came to be widely known by that nickname. Concerned that the historic optic might be damaged, and with new smaller lights able to output even more light at a lesser cost, the Coast Guard removed the Fourth Order Fresnel from the tower, and replaced it with the 250 mm Tidelands Signal acrylic optic, which remains in the lantern to this day. Vessels entering and leaving The Thunder Bay River still pass "the Sputnik," yet few know the story of the Alpena Lights, and how Keeper E G Howard valiantly fought to try and save them back in 1888. With this history, we are happy to help put a few chapters of the forgotten story in place. 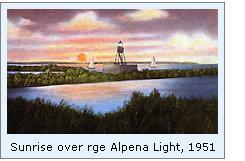 Click here to see a complete listing of all Alpena keepers compiled by Phyllis L. Tag of Great Lakes Lighthouse Research. There are precious few locations from which the Alpena Breakwater Light can be seen. After cruising around the downtown area, we ended-up taking the photograph seen above from the Coast Guard headquarters. The harbor over which the lighthouse stands vigil is very industrialized, however most of the buildings appear to have seen better days, and thus it would appear to have been an extremely busy port in earlier times. Alpena is the home of the popular annual Great Lakes Lighthouse Festival, and thus it is likely that with so many lighthouse buffs coming into town every Fall, the little Alpena light is fast becoming one of the most photographed lights in the Great Lakes area! From Downtown Alpena, turn East on 1st Avenue, and continue two blocks to the Thunder Bay River. Park wherever you can find a parking space, and walk to the riverfront. The light can be seen to the South, at the mouth of the river.